First Appearance: Mother Goose Tales (1697): "Little Red Riding Hood"
The story of Little Red Riding Hood and the Big Bad Wolf was a traditional European fairy tale whose precise origins are unknown. The story was in circulation among French and Italian peasants at least as early as the 14th Century. The first published version appeared in Histoires ou contes du temps passe, published by Charles Perrault. Interestingly enough, in the original version of Disney's classic "The Three Little Pigs" film, the Big Bad Wolf at one point disguises himself as a stereotypical Jewish peddler. This scene was removed from the film for a long time and replaced with a less offensive scene, before finally being restored on current DVD releases. 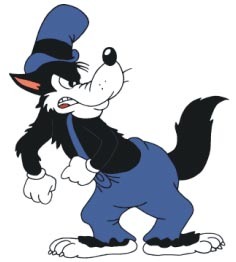 According to the excellent "Disney's HooZoo" website, Disney's version of The Big Bad Wolf made his first appearance in print in a story titled "Silly Symphonies: The Further Adventures of the Three Little Pigs" in the comic magazine Four Color #52 (Jan. 1936). This may indeed be the first appearance of the character, or perhaps simply the first appearance within this publication. But according to the very authoritative Comics.org, Four Color #52 was actually published in September 1944. We believe this date to be accurate, and that puts this publication after the first comic book appearance for the Big Bad Wolf that is identified by ComicVine.com: Walt Disney Annual #1 (1937). Faerie Tale Theatre - Season 4, Episode 1 (12 Feb. 1985): "The Three Little Pigs"
Mother Goose Tales (1697): "Little Red Riding Hood"
Nursery Rhymes and Nursery Tales of England: Obtained Principally from the Oral Tradition (1843): "The Tale of the Three Little Pigs and the Big Bad Wolf"
Super Why! - Season 1, Episode 1 (3 Sep. 2007): "The 3 Little Pigs"
Super Why! - Season 1, Episode 7 (17 Sep. 2007): "The Boy Who Cried Wolf"